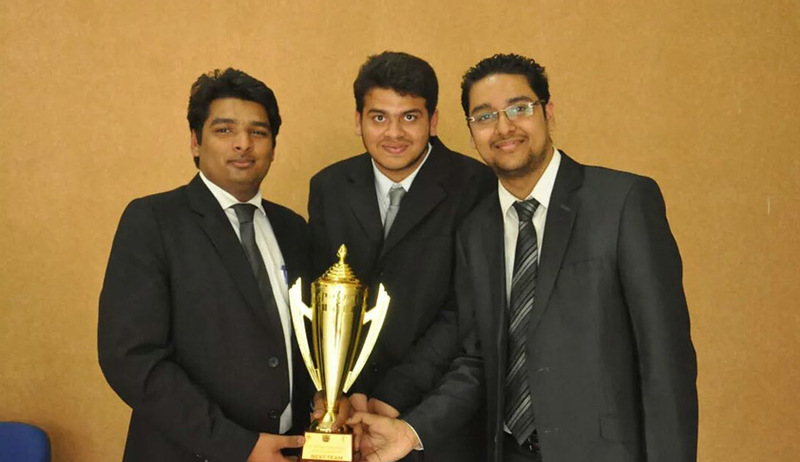 Yash Bansal (2nd Yr), Vivek Hegde ( 2nd Yr), &Mohith Gauri (2nd Yr) of ILS Law College, Pune were the Winners at 5th NLIU Juris Corp National Corporate Law Moot Court Competition, 2014′. The Moot was organised by NLIU Bhopal. Live Law: NLIU Juris Corp Moot Court Competition is probably one of the most prestigious national moots in India, especially within the sphere of corporate law moots. How does it feel team? Team: It feels amazing, to say it simply. But it's rather unbelievable because this happened to be our first national moot and winning such a big moot did turn out to be a great experience for us in all aspects. I think the fact that this was our first moot coupled with the moot itself being such a reputed one made it great was us. Live Law: What it takes to win a Moot Court Competition? Does winning approach matters? Team: It's really hard to lay out parameters in such a sense because each moot is different, the skill set required in each is different, the sort of research one has to do is different. But being strong with the basics of the laws involved helps immensely in the moot. So making one's basics strong and the related procedure is certainly bound to give a team a significant edge. The approach for sure matters a lot. We went into each round like we had nothing to lose and that really took the pressure off us since we looked at every round from the perspective of learning something, and that turned out to be a good strategy. Live Law: What it takes to be a great Team? Team: Good research abilities, understanding fellow team mates and cooperating with them is what we can think of right now. We are no one to say what makes a great team though but this is something we think our team had. Live Law: How was this Competition? Who all were your Opponents? And which team made you sweat or gave you a hard time? Team: The competition was really tough as you'd expect from a moot of this level. We'd also at this point like to commend the efforts of the organisers for making sure the competition progressed smoothly. Everyone from the core group to the volunteers were always there to help. The judges too were brilliant. We faced JGLS followed by RGNUL, Punjab in the preliminary round. Further we faced Sastra University, GLC Mumbai, SLS Pune and HNLU Raipur in the Octas, Quarter finals, Semi finals and the Final respectively. We think that the semi finals and the final was tough for us. Both those teams had arguments similar to ours, so it was really difficult was us to make sure that we had an edge over them. Pointing out some factual and procedural flaws, and incorporating that in our arguments really helped us in these two rounds. Live Law: Is there a Pre-mindset that you guys had before going for Moot? Team: The mindset that we went into the moot with was that we must learn as much as we can from this moot and if we reach the crucial knockout stages that'll be a sort of bonus for us. Like we said before we went into the moot like we had nothing to lose. Live Law: At what point of the Competition you guys realised that you can win this moot? Team: When we made it to the finals we knew there was a chance but the realisation moment never happened. The final too was a really tough round. Live Law: How was your all round experience? Team: It's been a very enriching experience for us. We got to learn a lot from the judges especially and the teams. Apart from this NLIU moot court society did really well in every aspect of organisation which added to our experience. Live Law: What do you think got you success in finals? Who all chaired the Finals? Team: We think it's a question meant for the judges in true sense, it'll be really wrong for us to speculate as to what got us the success in the finals especially when we had people like former Supreme Court Judge Justice A.K. Patnaik, Supreme Court Judge Justice Gopala Gowda, Senior Partner of Juris Corp Mr. Mustafa Motiwala and Partner Mr. Sandeep Mahapatra on the finals bench. Live Law: What difference did you find between your team and the team which came runners-up? Team: It was a really tough round, we think there was hardly any difference between our team and their team. But we think the judges were convinced with the delivery of our arguments and how we structured our arguments to make it really simple logically while at the same time not deviating from the law point. Live Law: What is your advice to someone who has never mooted earlier? To someone who hasn't done moots earlier our only advice would be that researching as much as one can and being confident with one's arguments can help you win a moot. For all you might know the argument that you are running may turn out to be something no other team thought of. Well thank you so much Team. We wish you all the Best for your Future. Thank you for talking to us.